The Forklift Container is built strong enough to handle almost any load. The deep forklift pockets make it very stable during transportation. It is 45.5” long x 39.5” wide x 36” deep; and tapers to 36.5” long x 30” wide at the base. They are stackable when not in use. to resist dents and punctures and won’t rust or corrode. They can withstand rough use; and yet are light enough for easy handling. Ultra-smooth, seamless bodies with no corners mean less chance of bacterial growth and easy cleaning. 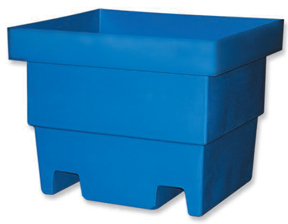 Rounded bottoms allow for easier dumping and unloading. 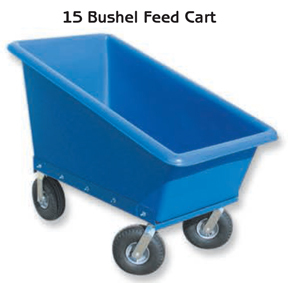 Feed Cart Wheel Assemblies feature all-welded, bolted on steel frames for solid support and durability. Large wheels include smooth-rolling bearings and semi-pneumatic tires. Front wheels are mounted on ball-bearing swivels for full, 360° rotation. All bolts, nuts and washers are included for easy installation. Outside Dimensions 44" x 24" 50" x 30" 56" x 32" 56.5" x 29.5" 67" x 33"
Depth of Hopper 24" 24" 24" 16.5" 24"
Overall Height 36" 37" 37" 42" 37"
Load Rating 400 lbs. 500 lbs. 600 lbs. 600 lbs. 800 lbs.